Gamers who are fans of the NBA 2k Series should know that every year a new game is out and this year it’s NBA 2K18. As usual, a new cover athlete for the game is chosen and this year it’s Kyrie Irving of the Cleveland Cavaliers but he’s the cover athlete for the standard version of the game. Also, Hall of Famer Shaquille O’Neal is going to be the cover athlete of the game’s Legend Edition. Like Last year three editions of the game will be returning which are Standard Edition, Legend Edition and Legend Edition Gold. Those of you who plan to Pre-Order the game will receive four-day early access to any of the editions in addition to some extra digital goodies. Below is a list of things players will get depending on the edition of the game they plan to purchase. 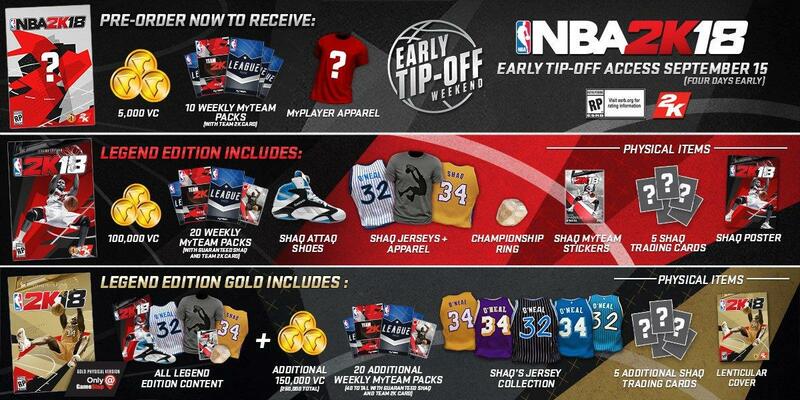 You may have noticed The two editions have different shots of the athlete doing his signature two-handed dunk and each Edition has Shaq wearing a different Jersey which is the Heats Jersey(Legend Edition) and the Lakers Jersey (Leged Edition Gold). According to a press release, the Legend Edition Gold physical edition will only be sold at GameStop for those in North America and will only be available digitally in Europe. NBA 2K18 launches on September 19th for PlayStation 4, PlayStation 3, Xbox One, Xbox 360, and Microsoft Windows. The early access period for pre-order customers starts on September 15th. These will be the prices that the games will be going for: The Standard Edition ($59.99), Legend Edition ($99.99) and Legend Gold Edition ($149.99).